The Cake Lady – her coconut pie is absolutely the best I have ever had. The Caye we went to was Caye Caulker, the smaller, and less touristy one. We actually went there to meet up with one my friends from the US that was on vacation there. Because there was 3 of us we decided to get larger accommodations and through a stroke of luck we ended up staying in the best Villa in the whole town – Villa Hermosa. It was right on the main street and it was heavenly. It had two bedrooms, an open concept with the breeze flowing in through the twenty or so windows, and hammocks in the front porch overlooking the main street of the Caye. My friend and I would sit for hours on the hammocks with the breeze flowing through our bodies. The only reason we would get off the hammocks was to stop one of the many vendors that passed by the house for some nourishment. We had the Cake Lady (she’s on YouTube) pass by every day once she found out we have a sweet tooth. She has been making cakes on this island since she was 16 (almost 30 years now), and she goes around selling delicious goodnesses like coconut pie, key lime pie, chocolate-coconut pie, banana bread and so on. We bought at least 3-4 slices of pie from her every day, resulting in our respective weight gains, I’m sure. 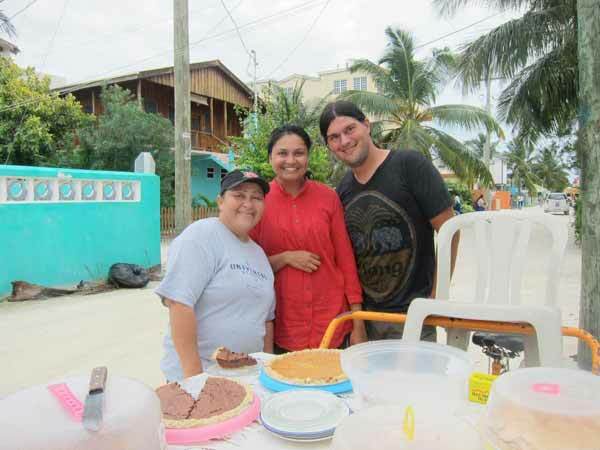 We also had meat pies, tamales, lemon tarts, hot dogs, and so on, from other vendors who passed by our villa at all times of days. They would yell out the names of the foods they were selling and my friend and I would instantly perk up. I think after a while they realized we are just food-crazy so they ensured they passed by our house especially if we were in the hammocks outside. Besides, the food from the vendors, the food in the restaurants, and the street stalls was extremely fresh and delicious as well. My friend had grilled lobster, where she pointed to a freshly caught lobster and they grilled it right there and then for her. There were people barbecuing chicken, shrimp, pork ribs and other meats all over the place. In addition, my friend and I love to cook, so we bought groceries, which were surprisingly cheap on the island, considering they have to bring everything from mainland Belize. We bought fresh fish from a fisherman who had caught the fish an hour before he sold it to us. He was cleaning his fish by the dock, where Thenix and I found them. The fish was so fresh that they were still twitching in the bucket, which kind of freaked me out a bit, I have to admit. We made curried chicken, and rice, eggs, and spaghetti Indian-style. The people in Caye Caulker are really friendly, and especially so, when they see two girls walking by themselves. The men would come up and start chatting with us without any encouragement from us at all. Some of them would start telling us their life stories after two minutes of chatting with us – trust is not an issue with the Belizean folk on the island. Even with Thenix around people would still approach us, but their comments were either first directed at Thenix or they were trying to sell us something. My friend and I were lucky enough to have a day of not-so-choppy waters, where we were able to go snorkelling in the Barrier Reef – the second biggest in the world, after Australia. If you have never been snorkelling in the reefs, it is an experience in itself. Sharks were a metre away from us. Our tour guide flipped the shark so that it went comatose, and we were able to pet them. Fishes of all varied colours, shapes, and sizes frolicked all around us. We also saw coral in shapes and colours I never knew existed before hand. The beauty of the world underneath water always astounds me. I have no words to describe the experience – all I can say is you have to go and see for yourself. Finally, the music playing on the island was absolutely awesome – reggae at its best. The music, the people, the breeze. It all caused all of us to be extremely relaxed and calm. I slept like a baby every night, falling asleep at the ridiculous hour of 7pm and waking up at 6am refreshed. It really was a tropical paradise in every way you imagine. - This post has been published in Tulum, Mexico. If you haven’t heard of the Big Trip yet, you are in for a treat. Boom & Thenix are driving a 1998 Honda Civic down to the southern most tip of South America, through the West Coast of the US, Mexico, Central and South America. We left on July 17th for this amazing adventure with the help of our sponsor Wise24. For a map of our trip so far, please click here. If you have questions about costs, visas, or anything else trip-related, please see our post on The Big Trip or check out our Archives.